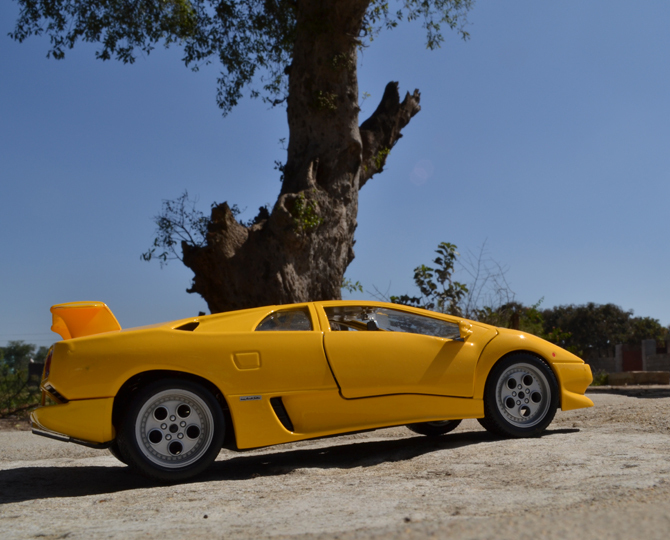 Diablo was the first Lamborghini capable of attaining a top speed in excess of 200mph. 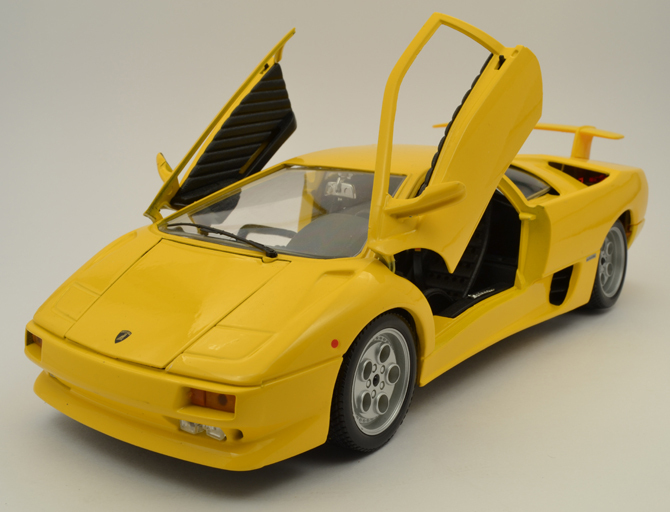 The Diablo was the fastest production car in the world for the 1991 model year reaching a top speed of 207mph, which exceeded the 201mph of the previous title-holder, the Ferrari F40. 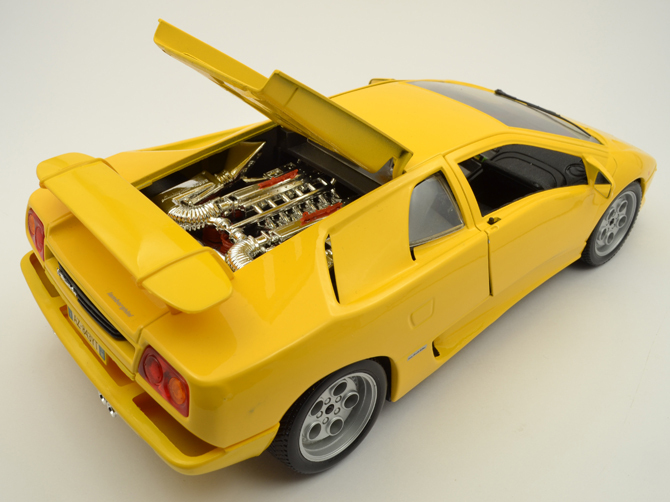 The rear-wheel driven Diablo’s V12 engine was mid-mounted to aid its weight balance. It could reach 100 km/h in slightly under 4 seconds. 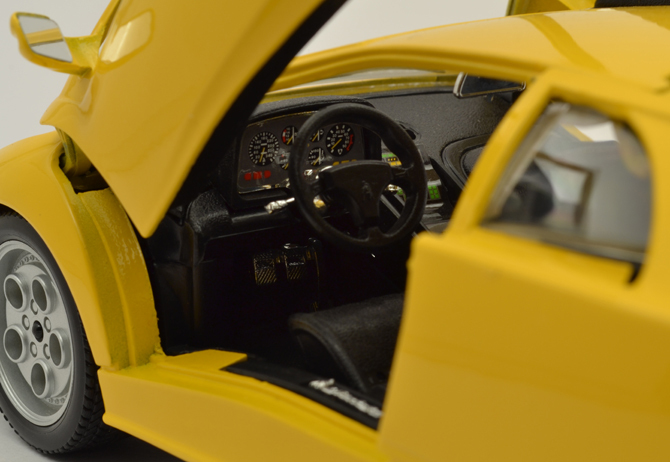 The Diablo came better equipped than the Countach; standard features included fully adjustable steering wheel, electric windows, and power steering. 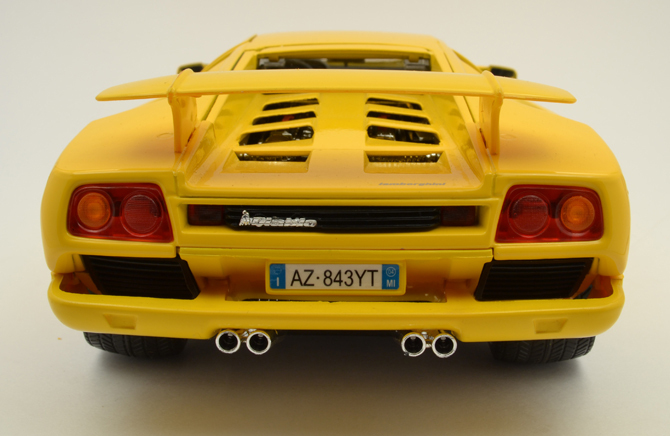 I have been a Lamborghini fan ever since childhood. 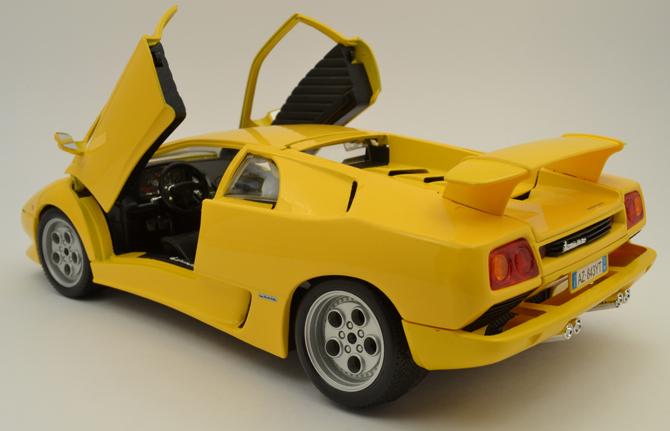 The Diablo’s modern car shape, mind blowing performance (say thanks to NFS series) and the scissor doors makes it hit in both performance lovers and aesthetic admirer like me. 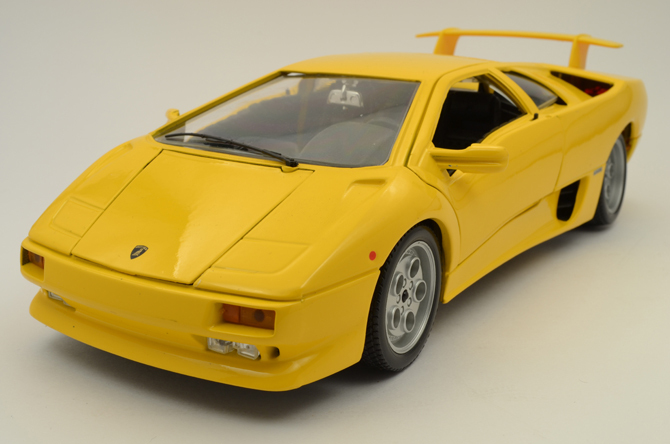 When I officially started diecast collection my first priorities were the Lamborghinis and Ferraris, so I not surprised when I hit the “buy now” button in DreamCarModels. 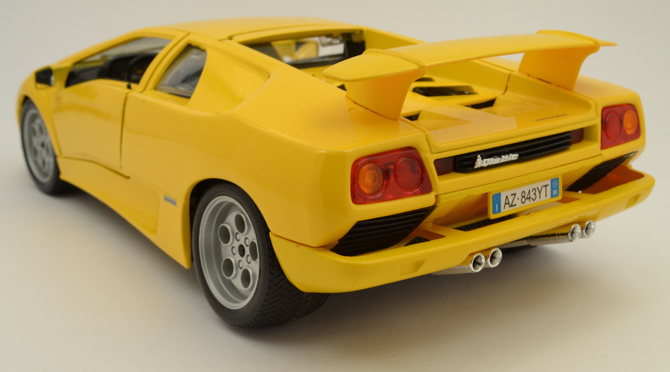 This Diablo is fantastic in terms of features and aesthetic accuracy. At 1:18 scale, there where alot of scope for exteriors and interior. 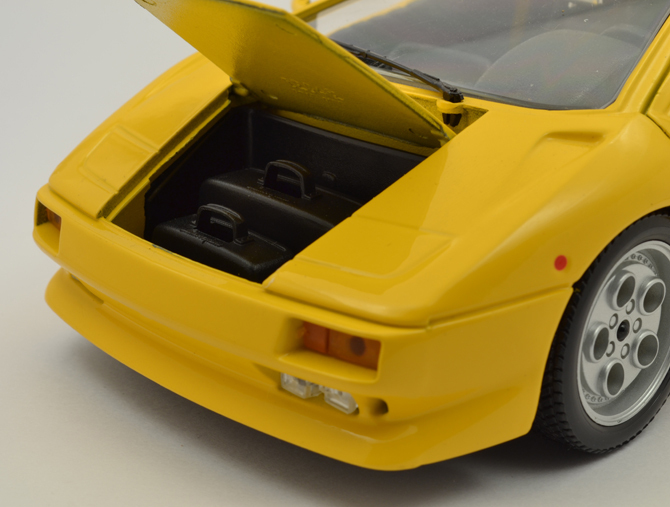 Bburagos are always known for exceptional bodywork and brilliant attention to details, this model is exactly what you should be looking at to justify the theory. 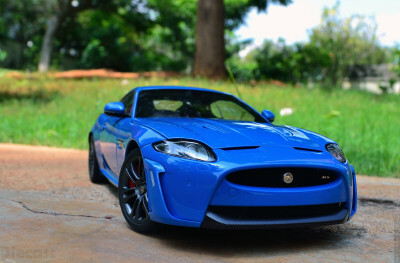 As always the paint finish is extraordinary the contour is smooth and every single element of aerodynamics maintained. 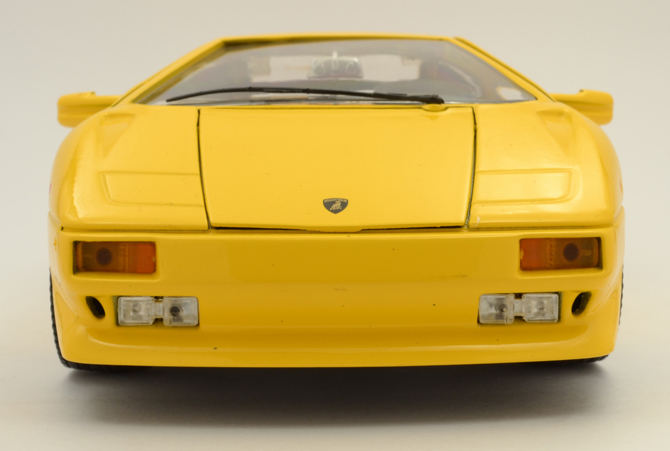 I am not so sure about the scaling but the rear view mirror and the spoiler is kind of out proportioned as per me. 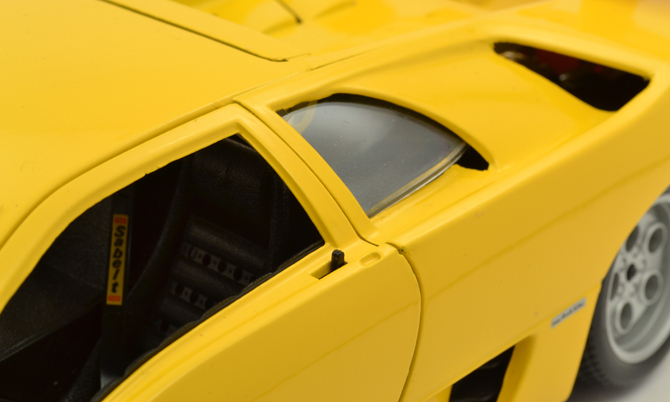 The scooping lines and the air intakes for the engine are accurate. The arrowhead like overall stance is perfect and enhances the visual hue of this German fighting bull. The miss on the rear is the reverse light (right side in the black insert), which in this model is replaced by a brake light in red as the other. 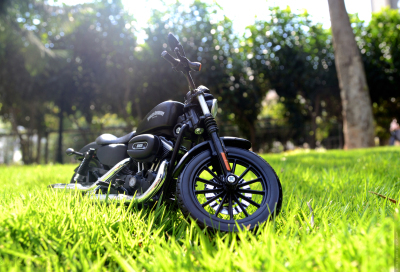 Most models in this scale come with working steering, opening doors, engine hood and luggage compartment upfront. 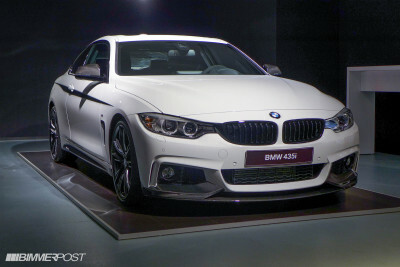 Unfortunately the model doesn’t come with working suspensions but that’s not a big miss. Bburago guys have gone into an extent of including a baggage kit inside the front luggage bin, which is a very nice touch but they are not removable. The all chrome engine finish is too much, which practically made this engine look like an after market modded version. I am not sure about the engine details also. Like the exterior, the interior aspects are superb! 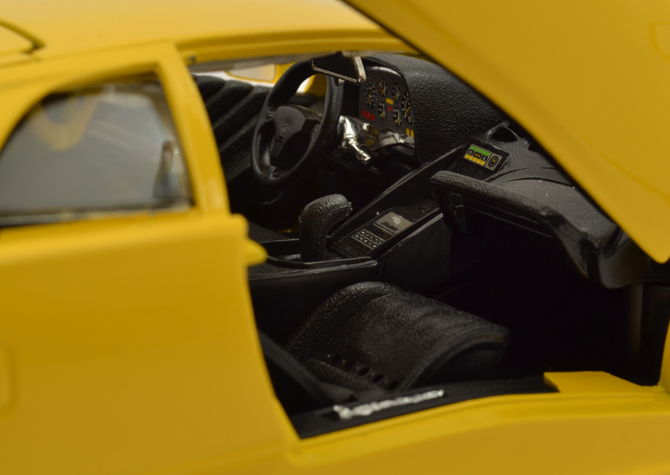 The instrument cluster is detailed, the dials are cool, textured floor replicates the carpet, plastic seats are well finished to leather seats extend, steering is well scaled (though the logo is not aligned properly) and the seat belts inclusion takes this interiors to a league of its own in the budget player arena. Addition of a working door lock made it a toy (as per me) from the precision scale model but works very well and its fun to play with it. 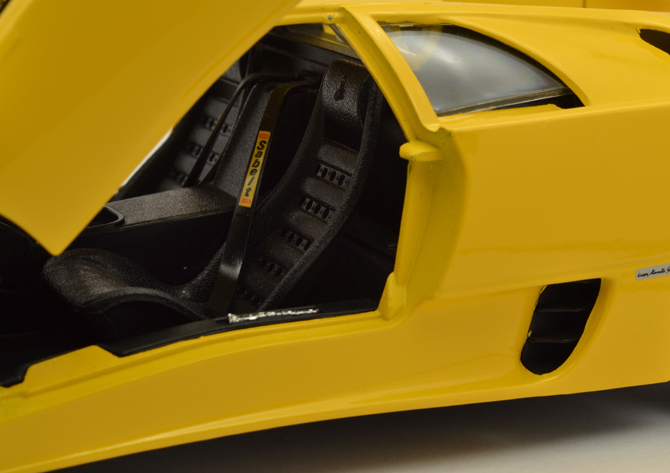 Overall a very good purchase and nicely fits with the rest of the Lamborghini in my collection. So what the score? It a 4/5! For the fantastic workmanship and dedication to work by Bburago. ige.com is made from fail.Bought gold and they stated it would take 15mins.It has been 10 days now still no sign of my gold.DO NOT trust these peolpeWhen you ask for a refund, they say we need the manager to do that trust me the manager IS NEVER THERE.